The IRS routinely targets activities engaged in by taxpayers for analysis under Internal Revenue Code §183, the so-called "hobby loss" rules. While taxpayers are allowed to deduct losses from business activities against other income, losses subject to Code section 183 are disallowed, and deductions are limited to the income generated from such activities. Furthermore, the Tax Court has increasingly used the “ordinary and necessary” restriction on business expenses to deny deductions with respect to sideline activities. Dozens of cases involving this issue are decided by the Tax Court every year underlining the need for practitioners to be aware of what to look for (and look out for) when advising their clients about the deductibility of business expenses and business activity losses. The problem is that these rules are really nothing more than a series of factors and the resolution of any case is fact-specific. 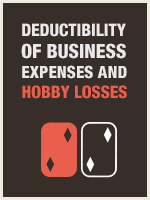 This course reviews the general parameters for establishing entitlement to business expense deductions and the criteria for distinguishing between deductible business losses and nondeductible hobby losses. The purpose of this course is to provide the practitioner with an overview of the common factual elements found in the relevant cases so that they can be better prepared to help their clients navigate these difficult waters. Determine permissible deductibility of business expenses under Code §162. Identify the required method for allocating expenses pursuant to Code §183. Name the elements of the 10-part test under the hobby loss rules. Recognize and determine the deductible expenses when an activity fails to meet the "profit motive" test.